Home > Law Books > Practice Materials > O'Connor's California Practice Civil Pretrial, 2019 ed. 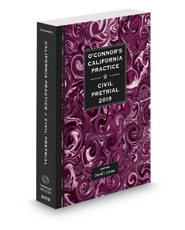 O'Connor's California Practice Civil Pretrial is a comprehensive yet portable guide to California pretrial practice. The book includes detailed commentaries that are organized in a unique chronological structure, the California Evidence Code, updated with recent legislation and annotated with leading cases, and timetables covering common practice areas to help you calculate important deadlines.